All Reach partners and associates are either registered or accredited members of BACP (The British Association of Counselling and Psychotherapy) and/or NCP (National Council of Psychotherapists). They have also either undertaken our therapeutic programme and/or our postgraduate training. As a result we are able to vouch for their background, experience, qualifications and skills. In addition to their continued professional development, all practitioners have clinical supervision as required by the national governing bodies and we at Reach, because of the holistic and integrative nature of our work, add an additional layer of supervision training to ensure adherence to our model as well as best practice. All of our senior practitioners and many of our partners/associates are also accredited supervisors and so those looking for supervision for their counselling and psychotherapeutic work can be sure they are in safe hands. We have a lot of contacts nationally and internationally and via Skype we are already offering supervision across the world, such as: the USA, South America, various countries in Europe, UAE and Australasia. Although we do offer supervision via Skype, the majority of our work in this area is still undertaken face-to-face – either one-to-one or in small groups. Should you wish to find out more about our unique approach, please read the additional articles listed belowand/or contact any of the following practitioners for more information on our approach, or to make an appointment. Also see: F.A.C.T.S and FAQs and What Makes The Reach Approach Unique? 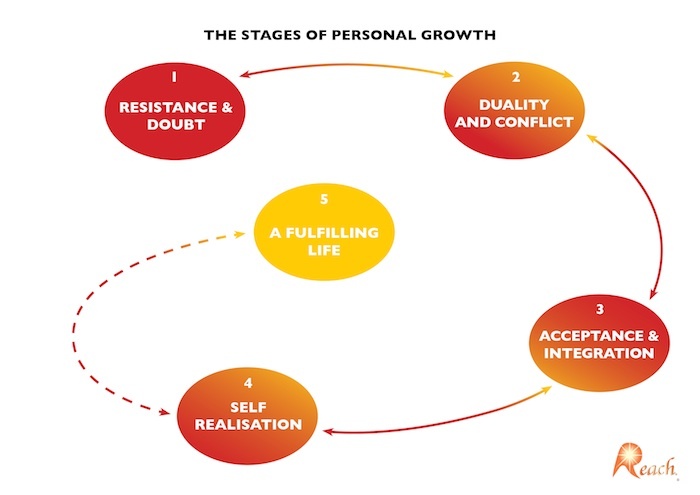 This mind map summarizes our approach to therapy – it outlines the key phases most pass through on their journey of self-improvement; a journey often peppered with challenge, duality and growth. The supervision we offer is very mindful of these phases, as it enables the therapist to be more effective in his/her work.